An artful blend of Jazz and R&B. Featuring Guest Appearances by Earl Klugh, Oleta Adams, Everette Harp, Paul Jackson, Jr. and other well known musicians. This one you will love. As a child growing up in Detroit in the '60's, being influenced by the Motown Sound was only natural. This gifted musician began playing bass at the age of 12, learning the bass lines from listening to recordings of the many Motown Artist. Piano lessons followed shortly after. Upon graduating from high school Al began playing in various clubs around Detroit and Canada with the group Free Spirit which featured Anita Baker as the lead vocalist. Playing professionally since the early eighty's, Al has performed with some of the top names in the music industry. In between touring the world with Earl Klugh for the past 10 years, Al continues to stay busy in the recording studios. You can hear his bass playing on recordings by Anita Baker, Aretha Franklin, Earl Klugh, Oleta Adams, Nancy Wilson, Bob James, Randy Crawford, Kem and Gladys Knight to name a few. Also you can hear "The Burner" on many television and radio commercials. In addition, Al has toured with Bob James, Oleta Adams, David Benoit and Everette Harp. Still residing in the Detroit area, Al has written and produced songs for Smooth Jazz recording artists Tim Bowman and Edgar Wallace, Jr.
Now after gracefully laying down the bottom end on hundreds of recordings, Al has released his debut CD entitled, "It's Good To Have Friends". The title is fitting because many of Al's friends are on this very fine recording. The CD features Earl Klugh, Oleta Adams, Paul Jackson, Jr., Everette Harp, Vernon D. Fails, Randy Scott, Ron Otis and other well known musicians. Bought the CD for my aunt who had to have it, she usually have a nice seletion and a great ear for good music. If she swear by it I had to give it 5 stars. It's good to have friends is an awsome cd.This is music you can listen to all day. I start and end my day with this cd. Thank you Mr. Turner for sharing you beautiful music with us. Great cd, good playing. Nice friends of Al's on the cd. Al Turner is one of the premiere bass players in the country. This project shows his versatility and command of his instrument. It's great to see that he utilized local musicians and vocalist (his friends) on this project. The really fun part is watching his animation in a live performance. Great Project! This album was great. It some of everything in it. Al you are a very skilful player. I love not just your stuff but also the accompanying music. Enjoyed this album 100%. I enjoy bass solo cds, and Mr. turner does not dissapoint. the cd is radio material, all tracks. the band is top notch. go get this cd, really nice. Not often does a musician like 'The Burner' come along. After watching him in smokey rooms like Piper's Alley & Doug's Body Shop, what a joy it was to see him at larger concert halls like DTE Theatre and the Masonic Temple here in Detroit. The true pleasure is seeing that the only thing smoother and more melodic than his playing - is his persona. Great music from a great brother (I wonder if it has anything to do with him serving a great God). Allow your ears & spirit to be blessed by this great music. Great CD from this solid sideman. I especially like the opener with Everette Harp. Oleta Adams has the midas touch and really stands out on vocals. 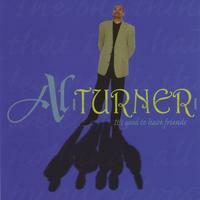 Hope this is the first of many cds from Al Turner. Peace. We went from Mexico to see him playing live at One World Theatre, Austin, tx. I like this alot. Congratulations to Al Turner and all the other contributors hard work. It was well worth it!